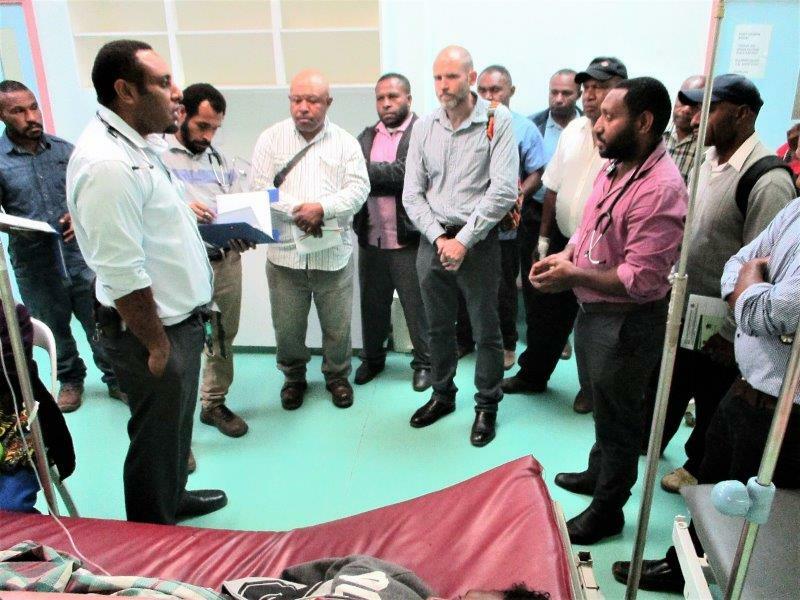 The newly-upgraded Emergency Department of Mt Hagen Hospital has the right ingredients to cater for any emergency situation, according to a visiting emergency physician from Australia. Dr Colin Banks, an Emergency Physician from Townsville Hospital in North Queensland said the Emergency Department was well designed and he was excited to see how clinical staff were handling emergency cases with professionalism. Dr Banks was at Mt Hagen Hospital at the invitation of the Western Highlands Provincial Health Authority (WHPHA) to see the new emergency setup and contribute ideas as well as to support clinicians in their work. 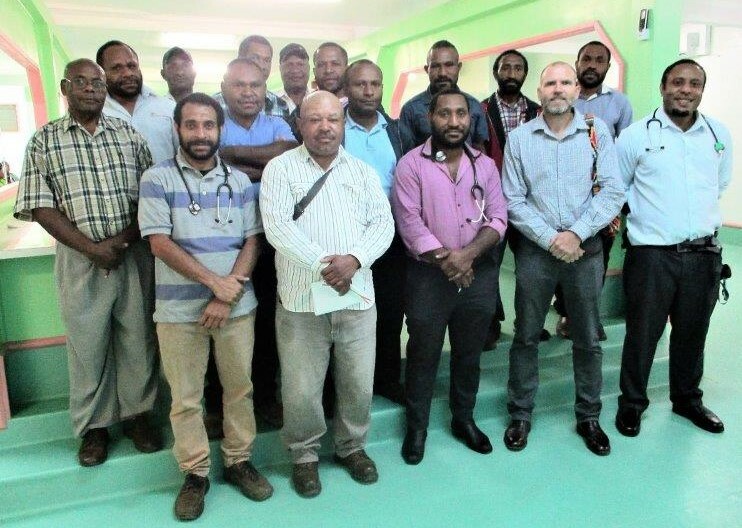 He has been visiting emergency departments in PNG for the last nine years to try and support them and the staff that work in them to ensure all protocols of emergency were followed for better outcomes. The Emergency Physician who has a special interest in developing emergency medicine and international training was accompanied by another colleague, Dr Rob Mitchell from Cairns Hospital who spent a day helping to set up the triage in the Emergency Department. Dr Banks who spent three days at the hospital from 23rd to 26th July also provided mentorship and training for clinical staff as well as helping with the layout of the building. He is also an external examiner of candidates for the Master of Medicine in Emergency Medicine discipline and was able to meet and find out how training was going on for three of the doctors who were currently undertaking this program. Acting Chief Executive Officer of the WHPHA, Ms Jane Holden thanked both Dr Banks and Dr Mitchell for spending time with the Emergency Department and helping to set it up as well as supporting the staff in their work. 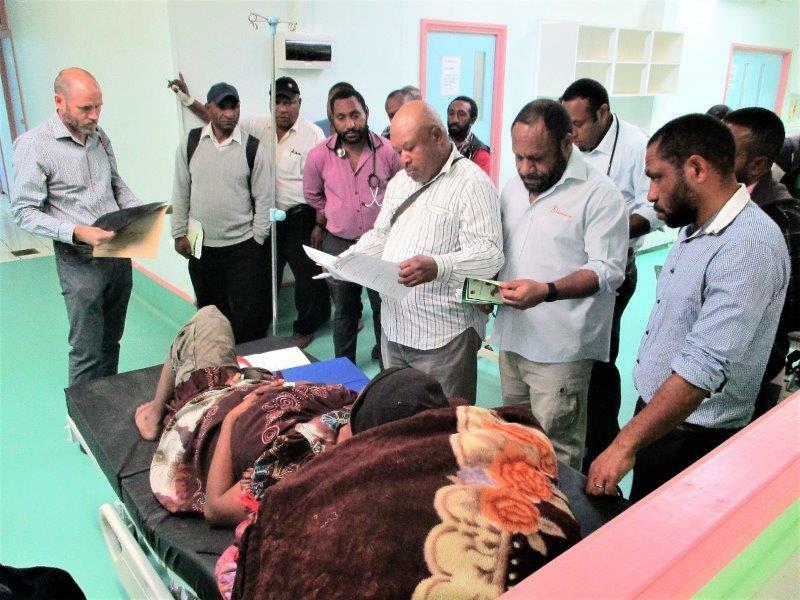 The Hospital’s Emergency Physician, Dr John Junior McKup said for the first time this year, Port Moresby General Hospital was running a Diploma course in Emergency Medicine for doctors in the Southern region and he wanted to see the same course conducted in Mt Hagen next year for doctors in the Highlands region. The doctors and health extension officers discuss the diagnosis of a patient and the type of treatment to be given. Dr Colin Banks (left) examines a patient’s X-ray while other doctors and health extension officers check her medical history to determine her treatment. Dr Colin Banks (standing front 2nd from right) is pictured with other doctors and health extension officers after completing their emergency ward round.